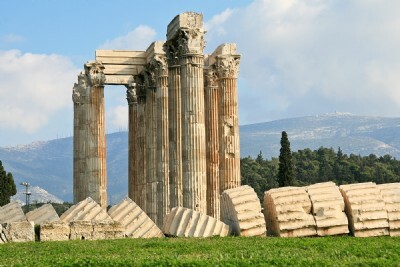 The Temple of Olympian Zeus is located just outside of the ancient city of Athens—east southeast of the acropolis. This huge temple went through several variations but the main one was begun in the fourth century B.C. Antiochus IV Epiphanes, Augustus, and others were involved in its construction. It was finally completed by the Roman Emperor Hadrian (ca. A.D. 132). It was 360 ft. [110 m.] long and 140 ft. [43 m.] wide. The building was surrounded by 104(!) columns of which 16—one toppled—are still preserved.